We’re sharing some of our favorite memories from the last week of fall quarter: the inaugural Aggie Moonlight Breakfast, the commencement speaker’s day (as captured in her own Instagram story) and another graduate’s amazing walk to receive his diploma. As finals week nourishment, Chancellor Gary S. May, the ASUCD Coffee House and Student Life hosted the Moonlight Breakfast in the CoHo last Tuesday (Dec. 11). Chancellor May and LeShelle May and other campus leaders served pancakes (with gluten-free as an option), breakfast burritos (egg-and-bacon, vegan-vegetarian and gluten-free options), fruit cups, juice and coffee to some 1,800 students. They formed two lines, one that snaked all the way back to the Campus Store in the Memorial Union’s East Wing. The Cal Aggie Marching Band-uh! managed to squeeze in for a couple of songs, waking up anyone who might have been napping in the MU! Just over 800 students participated in Saturday’s commencement (Dec. 15). Among them: Annie Chao, who put her communication degree to work during an Instagram “takeover” that day — granted permission to post to the @UCDavis page about her preparing for and anticipating her important job at commencement, as the student speaker. We’ve uploaded her Instagram takeover to YouTube, here. Image captured from video shows Michael O’Hearn walking across the stage at commencement, Dec. 15. 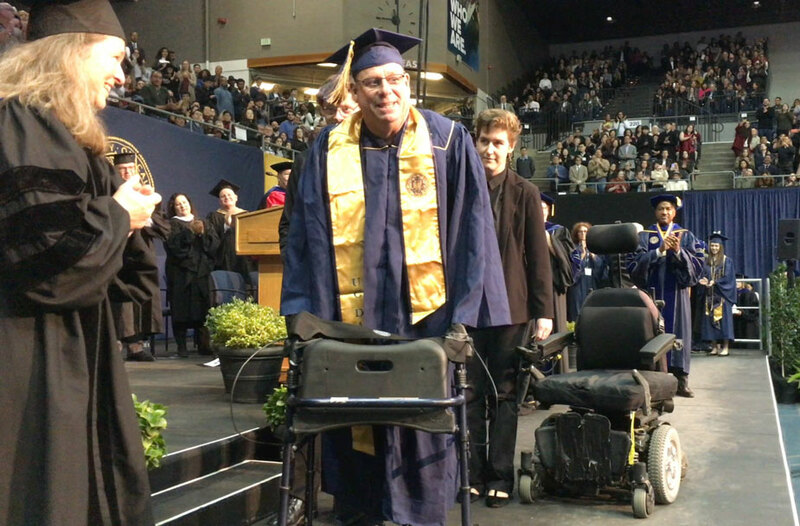 Last week’s Dateline included a news release, “UC Davis Student to Hit High Note With Walk at Graduation,” about Michael O’Hearn, among a just over 800 students who would be participating in fall commencement, Saturday (Dec. 15). The UC Davis social media team posted video of O’Hearn’s walk, describing it as “an amazing moment in Aggie history,” and saying to O’Hearn: “We’re so proud of you! Congratulations!” See the post with video here, on Facebook. Indeed. See you in the New Year!